What a beautiful Sunday. The sun was shining…it was about 65 degrees in sunny east bay California. 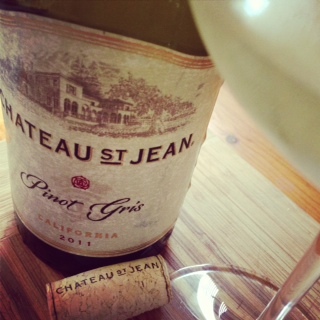 This was a great day to pop open the Chateau St Jean 2011 Pinot Gris. I did happen to find this wine at my local grocery store for $8.87. It regularly sales for $12.67. I thought what a great deal so I brought it home for dinner and a movie. This wine had aromas of lemon and melon with a hint of minerality. On the palate was citrus, a really nice tangy melon, and a slight orange floral note. The wine had a slightly short finish but well-balanced with acidity. Alcohol 13.2% by volume. Sipping on this wine while making dinner was very delightful. It went quite well with baked salmon. I believe this is the only wine at Chateau St Jean that is fermented and aged in stainless tanks.